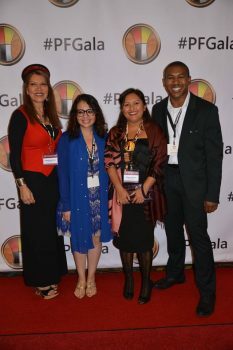 Left to Right: Dr. Charlotte Cote, Jessica Hernandez, Dana Arviso, and Keon Vereen at the 14th Annual Potlatch Fund Fundraising Gala. Why did you decide to pursue a Master of Marine Affairs? My bachelor’s degree allowed me to expand my knowledge of the ocean with courses, internships and research. It also allowed me to comprehend the importance of integrating indigenous and scientific knowledge to promote a healthier environment. Since I wanted to continue expanding my horizons and professional skill sets, I decided to pursue a Master of Marine Affairs. Why did you decide to come to UW’s SMEA for graduate school? My final choices for graduate school were the University of Pennsylvania and the University of Washington. Even though you cannot judge a book by its cover, you can indeed judge a university by your first visit. After being awarded a grant from the National Science Foundation to visit all of my potential graduate schools, I chose UW because of the positive and welcoming interactions I had throughout my first visit. For instance, I met with the Graduate Opportunities and Minority Achievement Program (GO-MAP) and the staff offered me amazing support and were so welcoming—even though I had not committed to becoming a Husky yet. As a student of color, having such welcoming and supporting programs—like GO-MAP— are essential to our academic and personal growth. Programs like GO-MAP are rare at the graduate level and UPenn did not have one, so I leaned more towards UW. Are you doing a thesis or capstone project? If thesis, what are you writing your thesis about and why? If capstone, what is the project about? I will be the first dual-degree student to complete the “professional-course only track” at SMEA. However, I am completing a thesis for the School of Environmental and Forest sciences—where I will continue on as a doctorate student. My thesis is focusing on developing an environmental justice atlas that will document all the environmental injustice cases that have affected native communities in the Pacific Northwest. This atlas will serve as a platform for my dissertation work. One of the cases I will document is the Dakota Access Pipeline #NODAPL. Even though this movement is rooted in North Dakota, it has transcended into the Pacific Northwest—resulting in indigenous solidarity and activism among Coast Salish Nations and Tribes. What has been your favorite class at UW so far? Why? My favorite classes at UW were the two American Indian Studies classes I took with Dr. Charlotte Cote. These classes allowed me to meet one of the most influential and promising indigenous woman at UW and the PNW—Dr. Charlotte Cote (Nuu-chah-nulth). She is an amazing mentor, who pushes me forward with positive challenges. She has created spaces within her classrooms where I guest lecture on environmental justice and the topics I am most passionate about. Her positive energy and attitude contribute towards my motivation to continue working hard within an institution that was not created for students of color—in particular indigenous students. The classes were AIS 270—Native People of the Pacific Northwest (which I am serving as a TA this Autumn ’16 quarter) and AIS 475— Indigenous Resistance and Resurgence Movements in the United States, Canada, and Mexico. What do you like most about SMEA? The different levels of support you obtain as a student—especially from your cohort. They are always willing to volunteer or support your work—whether it is talk or event. What’s it like to live in Seattle? What do you do in your spare time? Seattle can become an isolating place when you first move here. However, once you find your community and family, it becomes a fun city. During my spare time, I enjoy visiting my Uncles and Aunts from the local tribes and learning more from their stories. Nothing beats having amazing traditional foods and company. If you could design your ultimate job after graduating, what would it be and why? My dream job is to continue serving as mentor to students—like myself— who are breaking barriers for their communities, tribes, and families as a college professor. I want to contribute to the decolonization of the environmental sciences by giving a voice to the voiceless in the environmental discourse. I want to continue teaching courses like the one I am teaching this winter (ESRM 490B), where I can provide platforms to community members to speak on the environmental injustices and issues they face. It’s time to learn and spread the word from native people and communities, not about them—especially in the environmental sciences. What is your favorite form of marine life, and why? I belong to the turtle clan and this is why the sea turtle—k’aa’naab ak—is very significant to me.